We recommend starting out with a reference build to get started fast and easy with Quatos. A reference build will provide you with a full parts list or a kit with all you need to build and setup a Quatos based machine without having to do a lot of measuring. This is by far the easiest and fastest way to get to enjoy the power of Quatos. The Reference build section is constantly being g updated with new examples. Varying degrees of “ready to fly” and “bind and fly” crafts will likely also be offered from Viacopter, Flyduino and other AutoQuad retailers. Contact your local AutoQuad dealer for details. 2) Currently Quatos uses ESC32 set in closed loop mode. You need to calibrate the ESC32 for your motor & propeller. A lot of motor & propeller combinations have been tested already and you could use the numbers from this database. You can find details about ESC32 calibration here and setting esc parameters here. 3) Determine the thrust characteristics of your propeller. We try to fit a profile of the form Thrust = A1*rpm + A2*rpm^2. A kitchen scale should give you good results. You can find more details and an excel file to do all the calculations here. 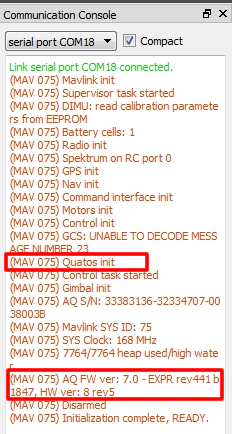 You can check whether you have a Quatos firmware in use (or not) using QGC connected to your AQ. This page was created on 18-Aug-14 by jussi. Last modified on 9-Mar-15 by MaxP.